This year’s latest W club has started off with a bang. Members were offered the opportunity to enter a lottery for the chance to purchase dolls from their latest ITBE collection. In addition to some familiar faces, a new character was introduced: Finley Price. That smile really grabbed me, so I was thrilled when my number was pulled. I’m so glad to add this character to my collection. I ripped this little cutie outta the box not long after she arrived. I redressed her right away (though I adore her lingerie) and couldn’t wait to share some photos. I really am liking this new character. Finley reminds me of Cruise Control Vanessa. Like she could be her sister or cousin. She’s got a similar feline quality that I really like about CC Van. And while she’s smiling, it’s not a vapid, empty-eyed psycho look. It’s more subtle and such a nice change from some of the stern and aloof looks possessed by IT’s other characters. Not that I don’t love a good snarl now and again. Just sayin’ I like the variety. Anyway, I’m looking forward to doing more in-depth photo shoots with Finley, when the proper lighting presents itself. Finley is wearing MAC Barbie’s blouse, an unidentified faux fur jacket that I picked up at a recent doll show, Barbie Basics jeans, and Integrity Toys belt and Agent Lotta Danger Poppy Parker’s earrings. Her photo was taken yesterday afternoon. The weather here was overcast, foggy and drizzly. Total crap lighting for photos. I didn’t even wander off our front porch. Not my best work by any stretch. But I couldn’t wait to share. 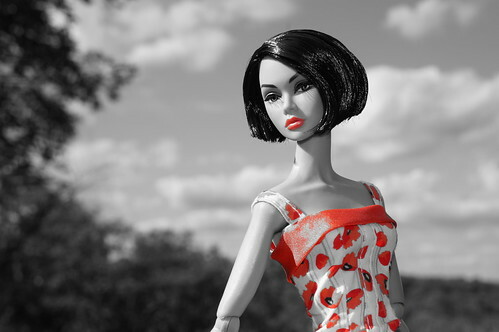 Sometimes it’s one little piece of doll clothing that inspires a photo shoot. Today’s model is Sweet In Switzerland Poppy Parker. She is wearing the turtleneck from one of the Barefoot in the Park giftsets, an infinity scarf crocheted by me, the skirt from Moxie girls Ida (today’s photo inspiration), her original tights, Lotta Danger Poppy Parker’s gloved hands, Outsider Misaki’s boots and a faux fur stole from Integrity Toys. Her photo was taken last week at my Mom’s house. Just wanted to pop in and wish everyone a very Merry Christmas! Today’s model is ITBE Zing from the Gloss convention. She is wearing Foto Fab Poppy’s dress, a Color Infusion jacket from the 2013 convention Style Lab and holds a matching cocktail (the chopped off top of a drink stirrer found at TJ Maxx). Her photo was taken yesterday by the wreath on our front door. Hey, folks! Long time no blog. I’ve come out of winter hibernation (after trimming the tree, wrapping the presents, mixing up batches of cookies…so much to do) to post some photos of a new favorite. I hope your holidays are merry and bright. 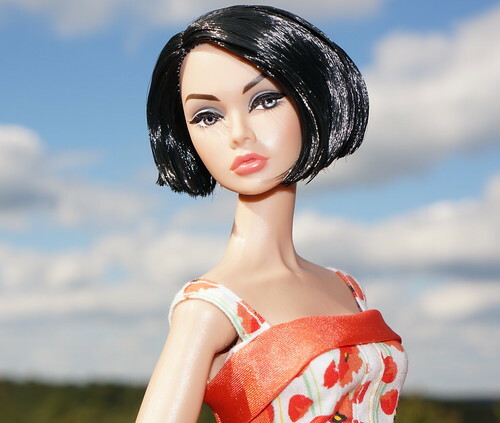 Today’s model is ITBE Jolt Amelie from the Integrity Toys Gloss convention. Her hair has been brushed out and she has been redressed. Amelie is wearing Dream Teen Poppy’s dress, a 2014 sweater ornament from Christopher & Banks, (and though you can’t see them in these photos) the tights from Sweet In Switzerland and boots from Agent Kimiko Gunn. Her photo was taken on Thanksgiving morning (though it looks more like Christmas) in our front yard. Recently, our area has participated in a couple of beautification events: Street Art Project I & II, where artists filled empty walls in town with fantastic art. Both Stroudsburg and East Stroudsburg in northeast Pennsylvania are now alive with vibrant images that photographers find irresistible. I took several dolls with me yesterday to grab some pictures. Today’s model is The Girl From I.N.T.E.G.R.I.T.Y. Poppy. She is wearing Exceptional Tatyana Alexandrova’s dress & belt, Successful Ascension gloves, Fashion Royalty patterned stockings and shoes from Dynamite Girls – Spooki Sooki: The Return. Her photo was taken yesterday on Main Street, Stroudsburg in northeastern Pennsylvania. Today’s model is The Girl From I..N.T.E.G.R.I.T.Y. 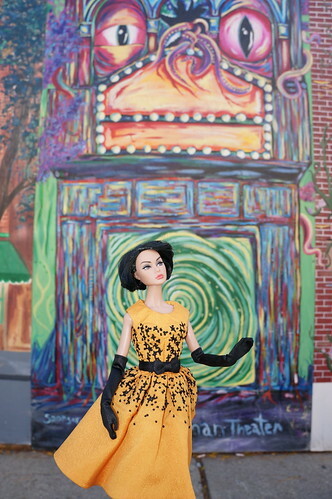 Poppy Parker, a W Club exclusive from the new Spy Poppy line. Her hair was been washed and brushed out. She is wearing the Barbie: Top Model Resort Summer dress and Dynamite Girls: Love Revolution – Natural Beauty Tooka’s shoes. Her photo was taken in the middle of September in our backyard. I adore her dramatic looks and sassy hairstyle. She’s a special gem in my collection and I just love her to bits! So, my brother tagged me for the ice bucket challenge. Today’s model is In the Air Poppy Parker from the Jet Set convention. She’s wearing an older Barbie swimsuit (maybe from the early nineties?). I’m pretty sure the bucket is from Mattel, but I’m not positive since I scored it at a flea market. The bench is a fabulous flea market find as well. Poppy’s photo was taken today in our front yard.